Hey everyone. 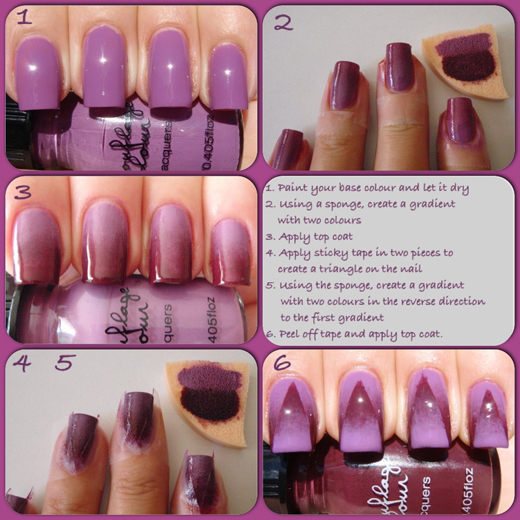 I'm back today with my second nail art tutorial using polishes from The Natural Source, provided by Lust Have It. Today's nail art design combines two popular nail art techniques, gradients and taping. I used two Camouflage Colour polishes in this design, purple and purple plum. Instructions on how to create this design are below in the pictorial. The process is very simple, you just create two gradients in opposite directions, allowing the polish to dry after the first one so you can tape off some sort of design. I used a deep chevron, but you could use strips too. Purple - a bright pink leaning purple creme. This was two coats and was one of the more opaque polishes in the collection. Purple plum - a dark red leaning plum jelly creme. This was two coats and you can see some transparency on the ring finger. All these polishes dry very, very shiny. I didn't use top coat in any of them. Skin - a yellow leaning flesh colour. Far too yellow for my skin colour but still a nice creamy yellow shade. This was three coats and it too had that same jelly creme finish. Black - a very sheer black jelly. This is four coats over a tan coloured gel polish I was wearing. I didn't think you would be able to see though to the base colour under black, I wasn't expecting this polish to be so sheer. I didn't use any top coat and it has a beautiful sheen. It's so sheer it might work ok for dark jelly sandwiches. If you read all this yesterday, they you may want to skip it, as this is a repeat of the same information. You also get the free mirror lined tin if you purchase eight or more shades. You can view all the nail polish shades on The Natural Source website. Now for the fun part. Lust Have It have kindly provided a three month subscription to one of my Australian readers - International ladies will have to sit this one out - but I have a BIG giveaway coming up later this month. Rather than just getting you guys to fill in a regular rafflecopter giveaway widget, I thought I would try make it a bit more fun and creative for us all. To enter, you first must follow Lust Have It and The Natural Source on Facebook. Then you have to add an image link to the inlinkz below which is inspired by one of the eight 'The Natural Source Camouflague Colours' I've shown (there will be four more tomorrow night). I'm looking for creative and interesting pictures inspired by these polish colours. Here are instructions on what to enter on the inlinkz form. URL: Optional, you can just leave this blank or put the image URL if you want. Name: "Your name - Polish name" by putting the polish name here, everyone can see which polish inspired your picture. Email: der - I don't think I need to explain this one. Thumbnail: Click to add your image, either from a webpage, upload or an image URL. If images are not your own, please link them from their original source. Facebook name for entry validation: Please put your facebook name in case you win and we validate your entry. Polish used for inspiration: please pick from the options of which polish it was you used. I've added a couple of simple images for you to get the idea. The boring but important part. This giveaway is run by More Nail Polish. Entry is open to Australian readers only. Competition begins March 12 2012 and ends March 18 2012 at midnight. To be eligible to win, entrants must follow Lust Have It and The Natural Source on Facebook and must submit an inspirational photo as directed, based on one of the shown nail polish shades. Entrants may enter up to eight times, once for each of the eight nail polish shades. Entrants must provide their Facebook name and email in the inlinkz widget. Following More Nail Polish is not a requirement, although I do pretty awesome fun things here so you might want to come back regularly. If the winner is a follower of More Nail Polish - I've got an additional prize for them that will be sent by me in addition to the Lust Have It prize. The Lust Have It prize is a 3-month Lust Have It! subscription to the value of $44. This cannot be exchanged for money. Entries will be judged purely on creativity within 48 hours of closing. The winner will be notified via email by March 20 2012. The prize must be claimed by responding within three days of the email being sent. The prize will be forfeited if it is not claimed within three days. That is an amaaazing mani! Love the colours you chose. I also think those bottles are really cute.